Welcome to the Yana and Marty Davis Map Collection which is housed at the Museum of the Big Bend on the campus of Sul Ross State University in Alpine, Texas. Unique to the Yana and Marty Davis Map Collection is the true accessibility of the collection. For over thirty-five years the collector noticed that archives world-wide were intimidating to those merely wishing “to see” rare documents and books. Consequently the Davis’ insisted their maps be secure but available to students, researchers and the public. Enjoy these living documents of discovery! Nueva Hispania – New Spain – was the first viceroyalty created to govern the Spanish-claimed territories in North America. Covering present-day Mexico, Central America, and the Caribbean, along with the current US states that extend from Florida to California, the capital of Nueva Hispania was located in Mexico City. This map by Gastaldi, the first official cartographer for the Republic of Venice (Italy), was the first map for the general public devoted to New Spain. Gastaldi relied on reports from explorers such as Jacques Cartier and Giovanni di Verrazano to produce more accurate maps than were possible from the accounts of Columbus and Vespucci, but there were still many inaccuracies and blanks to fill in. For example, on this map, the Yucatan is shown as an island, and Texas as being mostly mountainous. 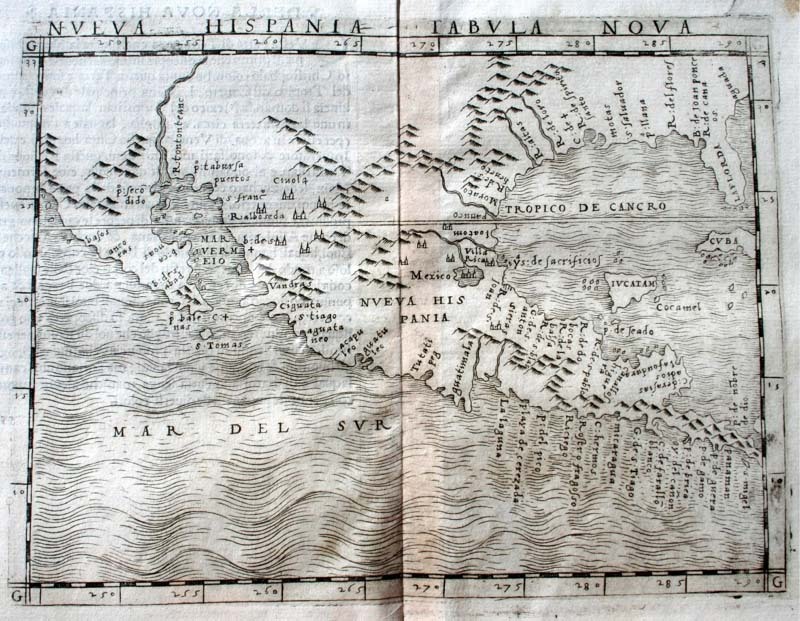 In producing this map, Gastaldi used a copper-plate engraving technique which allowed the printing of many more maps than was possible with a woodcut.